Domaschko Sensei began studying Aikido in 1989 and currently holds the rank of Sandan (3rd degree black belt). His martial studies also include Iaido (drawing and cutting with Japanese swords) and Jodo (the art of the Japanese short staff). He started Mushin Martial Arts in 2008. 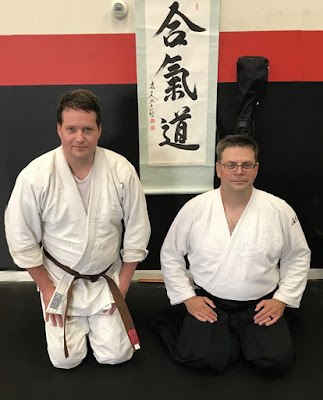 Feel welcome to write an email to Domaschko Sensei @ ohioaikido@gmail.com. A few initial visits are complimentary provided you contact us prior attending so we can expect you. All you need is sweat pants & a T-shirt to start; later, just a standard white Judo go. Standard is $75 per month for single member; family rates exist for multiple members ($110). Occasional testing fees also apply (nominally $40 but varies). 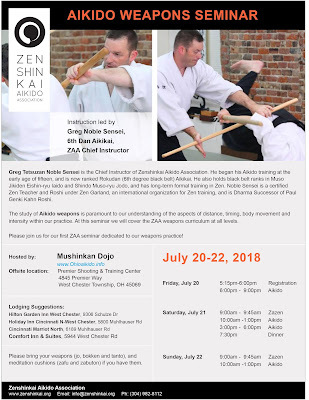 We are a founding member of the Zenshikai Aikido Association: (ZAA) is a national organization dedicated to developing and maintining quality, professional Aikido instruction. Aikido’s world headquarters, Aikikai Hombu Dojo, Aikido’s founding dojo in Tokyo, Japan, officially recognizes the ZAA’s ranks.